Solid cast brass with polished finish. An exact reproduction in both form and material original metalwork fittings designed by Antoni Gaudí for various of his works of architecture. This unique series was presented in the exhibition “Gaudí diseñador” (Barcelona, 1977) Antoni Gaudí (1852/1926) is, without doubt, the most internationally well-known Spanish architect. But is not only his buildings and brilliant architectural solutions that have travelled the globe. His integrated conception of architecture led him to pay attention, not only to structural calculations, but also to all the decorative elements, including furniture, that would form part of the building. Late Victorian spherical brass door knobs on circular backplates. Six pairs available. 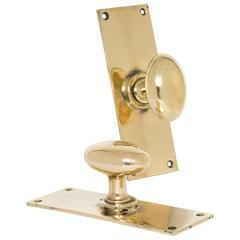 Exterior Schlage cast brass door knob set includes a lock with a 5 inch backset, and a key. 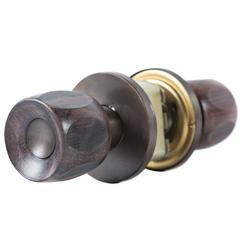 Old stock Russwin wood door knob set.